March 27, 2015, 2:47 PM · I wrote this article for the Butler Collegian and I thought anyone in the Indianapolis area might be interested in going! It's right on Butler's Campus! Larry Shapiro, the first official full-time instrumental music professor on Butler’s campus, has been teaching here for about twenty-eight years. Over 70 years old, Shapiro said he plans to keep teaching well into his 90’s. Shapiro began playing the violin when he was just six years old. “Sixty-seven years later and I’ve almost got the hang of it,” Shapiro joked. “I chose the violin because it was the hardest, and I was right. “My house was always full of classical music, it was natural to me,” Shapiro said. Although he was a natural-born musician, Shapiro went through a typical youthful rebellion. Shapiro started out as an English major at Columbia University. He refused to play the violin for a couple years. Soon, he left and went to play tenor sax in a dance band in Dallas. He returned to New York and met his wife of over fifty years, Ashley. “That was when I realized I couldn’t live without it,” Shapiro said, referring to his violin. Although Shapiro was a little behind when he first started out because of his hiatus, his talent did not go unnoticed. Shapiro soon dropped out of Colombia and attended the noteworthy Manhattan School. People would call Shapiro after seeing him play, begging him to play for them. 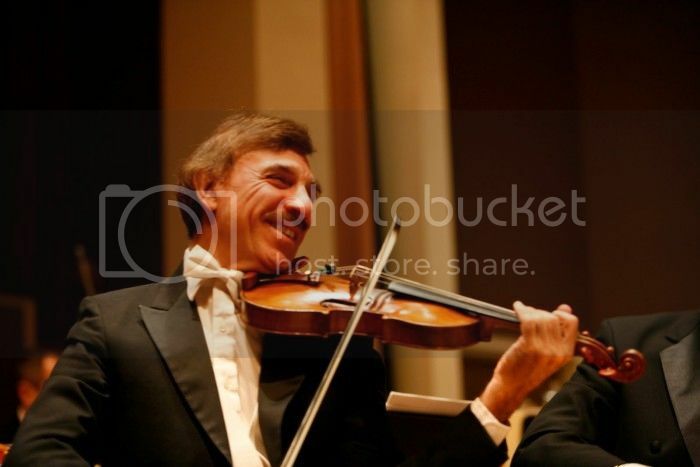 He was an original member of the American Symphony, as well as assistant Concertmaster of the New York City Opera. Shapiro, however, has not always had it easy. A car accident a few years back left him and his wife, Ashley, with severe injuries. Unfortunately, Shapiro suffered a shoulder injury that he is still recovering from today. As of late, Shapiro underwent cataract surgery for both eyes because he could no longer see the music. Because of this, Shapiro had to move back his recital to March 31 to have sufficient recovery time. But he won’t let anything stop him now. Shapiro said he likes to associate a theme with his recital programs, and this year the theme will be “Musical Bonbons,” or short musical compositions that he thinks are treats. Shapiro has gathered ten works from Mozart to Gershwin, even including a fiddling tune that he prepared himself. Shapiro said he believes music is more eloquent than words. Music, in his eyes, has the power to transform lives. Kim Busic, one of Shapiro’s students, had nothing but sincere words to say about Shapiro. Being here for almost thirty years, Shapiro has watched Butler University evolve. Still, Shapiro believes that there is one thing about Butler that makes it stand out from every other institution that he has taught at. Larry Shapiro will give his yearly recital at Eidson-Duckwall Recital Hall on Tuesday, March 31 at 7:30pm. March 29, 2015 at 07:12 PM · That's wonderful and inspiring! I'll never forget the kindness and warmth with which Larry welcomed me to campus a few years ago. March 30, 2015 at 09:11 AM · The story is very encouraging! March 30, 2015 at 05:15 PM · Larry Shapiro is one of my most influential teachers at so many levels. First of he was very influential in my coming to the U.S. to study with him and once I got here (I didn't speak english) he became a surrogate father and mentor. He would speak slowly in my early lessons which I recorded and then listen back in my room and translated them, so he taught me english too. His influence in me as a human being and a communicator can be heard in every lesson I teach today as I quote him so much. I will forever cherish all those lessons, especially the "talking lessons" where we talked about life, history, current events, and sometimes about music too! Un Abrazo y Feliz Cumpleaños Lorenzo!